Our biggest sponsors and Beth, the owner, is a Trustee of the Last Chance Hotel. 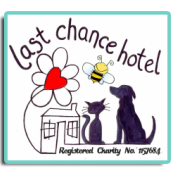 ​Collans Cross Kennels are supporters of the Last Chance Hotel and also recommended by us. Monument Vets are a family run concern and we look forward to working with them at their Cardrew branch, Redruth. Mandy is a massive supporter of the LCH and helps us out in many ways. She is also Sue's sister (Sue of cat rescue fame). ​Kathryn often treats our rescue dogs to a spruce up, - the shy, the troubled and the difficult! Highly recommended. ​Our all important transport vehicles are kept on the road by Karen and the team at North Country Garage. ​Lynn supports smaller dog rescue charities by hand knitting dog coats. ​Glendee Dog Rescue are based in Hertfordshire and help us with kennelling emergencies. Anne-Marie is a wonderful supporter of LCH and has produced a rhyming story book for children about one of her many Last Chancers, Chunk. Rayna is a lovely supporter of LCH and a talented artist. Have a look at her Facebook page. Gill Abram is a fab supporter and volunteer for LCH. She has just started her own travel business. Check out her Facebook page. Mackerelbus Design are lovely supporters, designing and donating a fab new banner for the High View Farm gate. We work closely with Wonky Pets, who take in animals with special needs. Lizzie's Barn Sanctuary in South Wales rehomes dogs throughout the UK, as we do, subject to a good home check. Dan and his team are fab supporters of LCH, their shop in Holsworthy is full of all sorts of pet related goodies.